Investors have big questions heading into the spice giant's next quarterly report. The consumer packaged foods industry is under intense pressure, but the spices, flavorings, and condiments niches are bucking that negative trend. McCormick (NYSE:MKC) is the flavorings leader, and its premium positioning helped the company edge past management's sales and profit goals in 2017. Its $4 billion acquisition of the RB Foods portfolio, meanwhile, powered a solid start to fiscal 2018, with revenue jumping 19% even as gross profit margin improved. Investors are hoping for more positive news like that when McCormick posts its second-quarter results on Thursday, June 28. Let's take a closer look at the major trends to keep an eye on in that announcement. McCormick has aligned its portfolio to take advantage of global demand growth for tastier, healthier home-prepared meals. 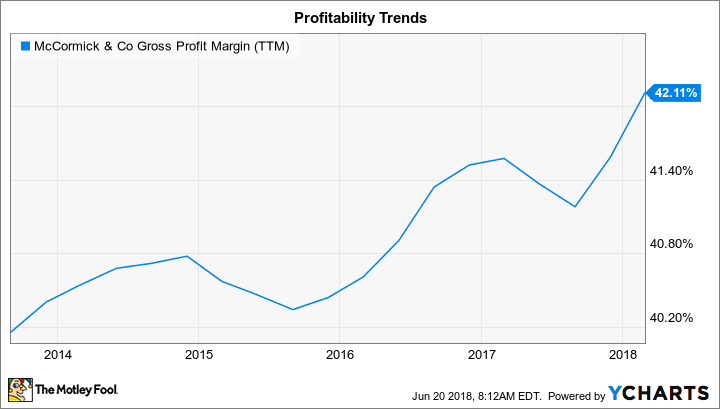 That's why the company believes it can modestly outperform the broader industry and grow annual sales by between 4% and 6% over the long term. McCormick trounced that target last quarter by showing a 19% spike in revenue. However, nearly all of that gain can be tied to its purchase of new brands like French's mustard and Frank's hot sauce. After accounting for foreign currency swings and the boost from the RB Foods portfolio, in fact, sales would have risen by just 2% in McCormick's consumer foods segment and by 3% in its flavorings division. Investors can expect to see similar results in the fiscal second quarter. Wall Street is targeting an 18% jump in revenue, mostly tied to the RB Foods products but with McCormick's core portfolio also logging modest growth. McCormick shelled out $4.2 billion to purchase the RB Foods portfolio last year, and the company hasn't yet demonstrated that this pricey acquisition was worth the cost. The buyout boosted its debt leverage, for example, which has led to a spike in interest expenses. CEO Lawrence Kurzius and his team also announced plans to scale back on stock repurchases over the coming quarters and prioritize paying down the new debt. In exchange, the company received a few dominant brands that should support faster sales gains. The acquisition is also projected to make McCormick's business more profitable overall. That's already happening, with gross margin improving by 2.4 percentage points last quarter to pass 42% of sales. Similar gains are expected over the next few quarters. MKC Gross Profit Margin (TTM) data by YCharts. Industry trends haven't improved much over the last few months, and in fact peers like Campbell Soup are struggling with the challenge of flat or declining sales, along with rising cost pressures that they've been unable to recoup by raising prices. McCormick's updated 2018 outlook should be largely free from those issues. Price increases, plus the shift in sales toward those premium RB Foods products, have management targeting a 33% boost in operating profit this year, to roughly $934 million. Sales gains will mostly come from that acquisition, and revenue is slated to rise by between 13% and 15% in 2018. Given the weak selling environment, I wouldn't expect much of an upgrade in either of those top- or bottom-line targets on Thursday. Yet its outlook for significant revenue and profit gains still makes McCormick a standout performer in the industry. Thus, investors who prize stability and income growth aren't likely to be disappointed by the company's latest operating and financial numbers.